Selina Thompson, Amy Nostbakken and Norah Sadava have been recognised by The Stage Edinburgh Awards 2017 in the final week of the Edinburgh Festival Fringe. Thompson won for her performance in one-woman show Salt, while Nostbakken and Sadava earned the award for their show Mouthpiece. This is the third award that Thompson has won for her show , which retraces the transatlantic slave route. The show also bagged a Total Theatre award for innovation, experimentation and playing with form, as well as the inaugural Filipa Braganca award  for the best female solo performance by an emerging artist at the fringe. 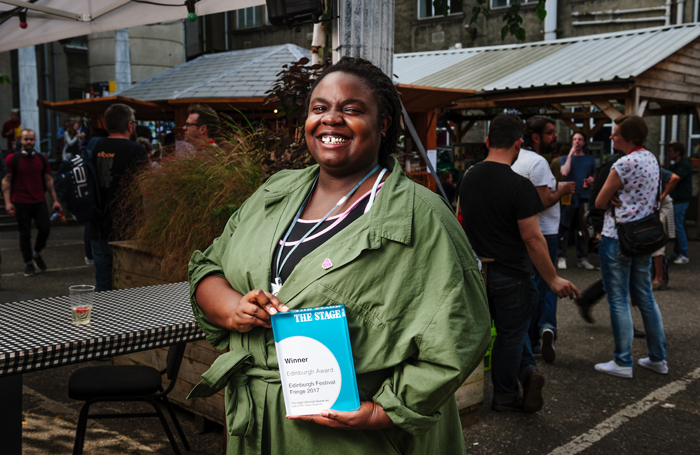 The Stage’s reviews editor and joint lead critic Natasha Tripney said: “I saw Selina’s performance on my first day at the fringe and it is stayed with me throughout my time. Salt is a piece of extraordinary emotional and physical commitment. Writing on Twitter, Thompson simply said “gosh”. Mouthpiece, which is running at the Canada Hub at King’s Hall, uses two performers to portray one woman’s psyche. Nostbakken said she was “thrilled and honoured” to receive the award.